UPDATED 8:42 P.M. ET U.S.A. Members of the faith community joining MLM HYIP schemes is a problem. It happened with the $119 million AdSurfDaily Ponzi scheme and the $72 million Legisi scam in 2008, for example. It’s happening currently with the “Achieve Community” scheme. Earlier, members of TelexFree — an alleged $1.8 billion pyramid scheme — traded on the words and images of faith, including the Christ the Redeemer statue in Brazil. The WCM777 and Profitable Sunrise schemes also traded on images of the statue. Promoters of the schemes targeted people of faith. Those schemes likely generated more than $100 million. There’s also evidence that people of faith were targeted in the $897 million Zeek Rewards scheme brought down by the SEC in 2012. New filings by the court-appointed receiver in the Zeek case show that an entity that identified itself as an “E.C.” (Evangelical Congregational) church sent $10,000 to Zeek operator Rex Venture Group LLC on Aug. 8, 2012. The payment was in the form of a cashier’s check. The PP Blog is declining to identify the church because details of its precise geographic whereabouts could not be learned immediately. But the check was drawn on an Alabama bank that allegedly later stopped payment. Zeek receiver Kenneth D. Bell is seeking a court order for the bank — BBVA Compass Bank — to turn the $10,000 over to the receivership. 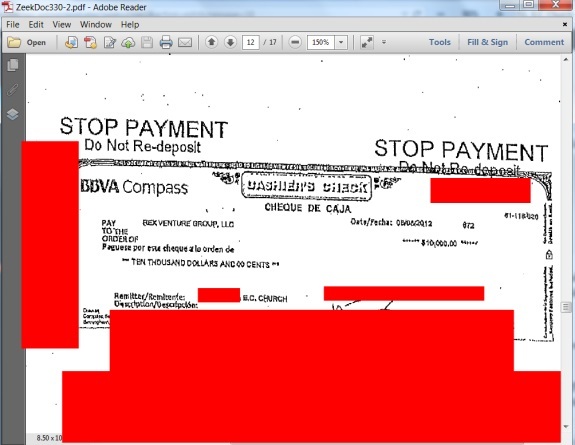 BBVA Compass also allegedly unlawfully halted payment on 23 other cashier’s checks sent to Zeek. These totaled $73,800, meaning Bell is seeking $83,800 from the bank. Those checks were receivership assets, and the bank’s decision to stop-payment after the receiver presented them to be paid violated the asset freeze in the Zeek case, Bell alleged. At the commencement of the SEC Action on August 17, 2012, RVG possessed thousands of cashier’s checks and teller’s checks received from RVG Affiliates that had not been deposited or presented for payment. Upon entry of the Agreed Order, the Receiver collected cashier’s checks from RVG’s offices and deposited them in accounts opened for the Receivership Estate. These halts by the bank were unlawful under the Uniform Commercial Code, Bell alleged. “Compass wrongfully accommodated its customers by stopping payment on all twenty-four cashier’s checks when it was not legally permitted to do so under the Uniform Commercial Code,” Bell contended. Although the filing is not on the subject of affinity fraud, documents within the filing suggest that the E.C. entity had company at Zeek among the faithful. Two checks among the 24 were drafted on behalf of an individual whose Zeek username included the word “blessing.” These checks totaled $2,300. Religious entities and people of faith getting recruited into HYIP schemes may not be the only problem. In the AdSurfDaily case, for instance, evidence surfaced that individuals had created purported nonprofits and religious entities into which to deposit their Ponzi winnings. In 2014, Bell asked a court to take “judicial notice” of certain videos on YouTube. MLM may have a problem with “serial participants” in Zeek-like schemes to defraud, Bell suggested. Given the check’s bilingual nature we’re looking at a Latino immigrant church. Other than that… no comment. Preying upon people’s faith, dreams, AND ignorance is despicable.